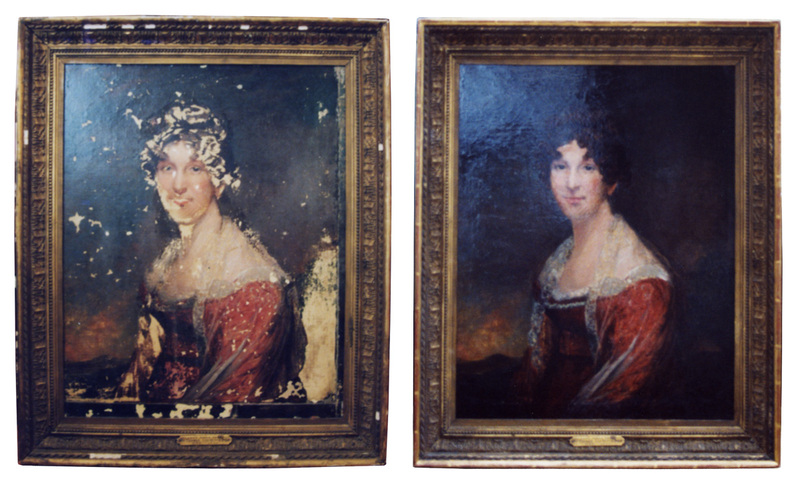 Restoration of valuable artwork is not for beginners, unless you’re under the tutelage of an experienced professional. This piece is by Sir Thomas Lawrence, a well-known British court portrait painter from the late 1700s – early 1800s. It was improperly “cleaned” by someone and then brought to me to fix. It was quite the task, as so much of it was removed that I had to guess and invent the details. So many people think that restoration is an easy process, but there is much to learn, and I find that I learn something new from each piece, even after 16 years of cleaning paintings! Today one can just go to the store and simply pick up a jar of damar varnish, but not so in the 1800s. Many artists invented their own formulas, or improved upon those of their master’s. By this point, the artists of that time would already seen that varnishes yellow, crack and shrink. In attempts to make a better varnish, artists sometimes resorted to chemicals that would bond over time to the paint, and become virtually permanent. In using strong chemicals to remove such finishes, it is possible to strip off the paint as well. Soft colors such as reds and browns are the first affected. If you wish to try restoration yourself, please try it out on artwork that you are sure isn’t valuable! This piece above was probably worth about $175,000 if it had been in good condition. Try out your chemicals in a small, inconspicuous area first, not in the center of the piece. To restore this piece, I researched not only other work by Sir Thomas, but the sitter as well. The portrait is of Lady Elizabeth Hope Vere, daughter of George Hay, the 7th Marquis of Tweedle (Edinborough) who was imprisoned by Napoleon. The Marquis and his wife both perished in jail at Verdun. Elizabeth was about 14 at the time. I found a society page that spoke of the lovely facinator/feathers in her hair that then became the height of fashion, and as there was evidence that there was something red in her hair, so I added a splash of that, to her right side (viewer’s left). I haven’t seen other images of this particular portrait online (which of course would have made my work on it so much easier!) so I think it may have always been in private collections. I also made castings of the missing chunks of frame. These were then glued into place and underpainted. Some areas received black base coat, some red and some yellow. It takes some detective work to see what is needed so that when the gold is applied the proper color shows through. The patination of the leaf is applied in layers and samples are made prior to working on the frame itself. Each frame is unique in its coloring due to the type of gold used (which can range from 18 karat up to 24, white, lemon, rose, etc), the base or bole underneath, what was used as the original antiquing and atmospheric conditions it’s been exposed to over the years.